This week, the World Bank released the latest issue of Africa’s Pulse–a biannual publication highlighting key macroeconomic trends in sub-Saharan Africa. The report highlights the region’s continued weak recovery from the commodity price shock in 2014, with 2018 GDP growth projected at 2.3 percent, lower than the rate of population growth. The current estimate for growth in 2018 is 0.4 percentage points lower than the October 2018 estimate as the region’s major economies grew slower than expected. The report also lowered growth projections for 2019 and 2020 to 2.8 and 3.3 percent, from 3.3 and 3.6 percent, respectively. This year’s special chapter focuses on leveraging the digital economy to eradicate poverty in Africa. The chapter provides an overview of the current state of digital penetration in Africa, the remaining gap, and the potential growth benefits of achieving the World Bank’s All Africa Digital Economy Moonshot project. The Digital Economy Moonshot targets a rapid expansion in fixed broadband, universal mobile phone and internet access, and an increase in human capital for women through more schooling. Access to mobile phones and internet have expanded rapidly in Africa over the past two decades. 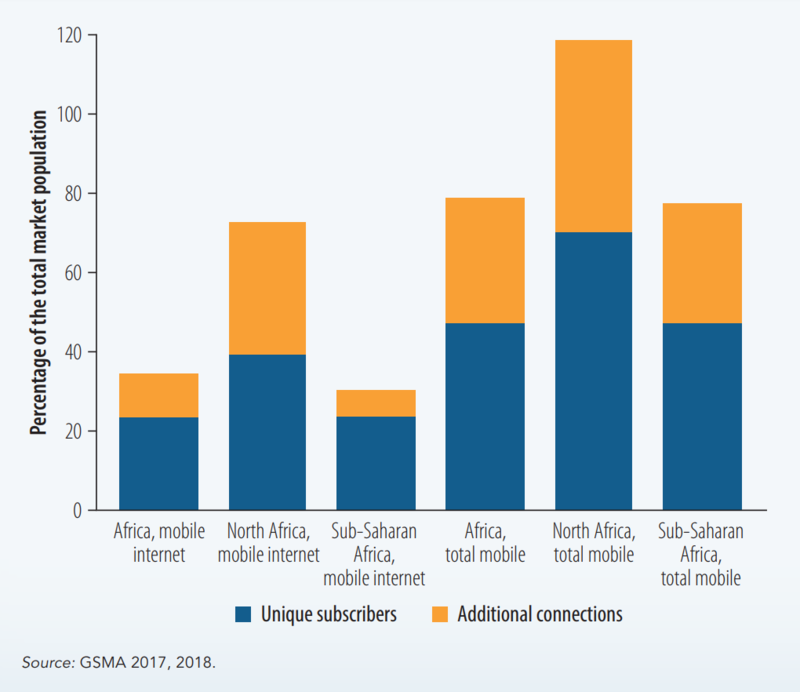 Sub-Saharan Africa had 300 mobile internet and 778 cellular subscriptions per 1,000 people in 2017. However, as Figure 1 shows, there is a significant gap between subscriptions and unique users, particularly for mobile phone connections. Looking at unique mobile subscribers, only half of the region’s population is covered, with the number closer to 25 percent for mobile internet subscriptions. Given the large gaps, the potential benefits of achieving universal mobile phone and internet access are significant. If the targets are achieved, says the report, growth per capita would increase by 1.95 percentage points in sub-Saharan Africa and 1.48 for Africa as a whole. The growth benefits are even larger for fragile, conflict and violence affected countries at 1.54 percentage points compared to 1.30 for the rest. These results would also translate to faster poverty reduction, with the rate of poverty reduction increasing by almost 1 percentage point in sub-Saharan Africa. According to the report, governments will need to play an active role in achieving these goals through supporting regulations, strong legal frameworks, and provision of skills training in technology-related sectors. Tax incentives on digital economy tools can help speed up adoption and increase usage of digital services. Allowing increased competition in digital economy sectors including telecommunications can also help lower prices in the sector, currently among the highest in the world. Additionally, governments should focus on adapting education and skills programs to the changing economy as the digital technologies become increasingly complex.